Hawaii is the most isolated chain of islands in the world. Millions of years before the arrival of Polynesians, plants and animals arrived via wind, wings and waves. As they spread across the islands, many of these plants and animals changed over time, losing their defenses against predators that weren’t present, including rats, mice, and mongooses. areas, from sea level to 9,000 ft., and continue to have a large impact on native species, agriculture, and public health. The introduction of rodents and mongooses resulted in, or contributed to, the extinction or endangerment of many native Hawaiian species. Rats and mongooses are omnivores, consuming a wide variety of food items including seabird, waterbird, and forest bird eggs, chicks, and even adults, sea turtle eggs and hatchlings. They also eat fruit, seeds, seedlings and flowers. Rats and mice also kill plants by chewing off stems and stripping bark from small trees. Rodents and mongooses also eat a variety of invertebrates such as native tree snails, slugs and insects. The loulu palms that cover the rodent free islet of Huelo (North of Molokai) are an indication of what Hawaii’s lowland forests may have looked like before the introduction of invasive rats. Introduced rats are similarly responsible for the loss of vast lowland palm forests throughout Hawaiʻi. 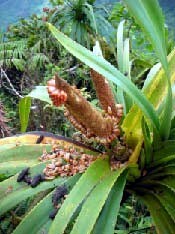 Areas like the Ewa plains were moist lowland loulu palm forests until rodents invaded and ate the seeds, flowers, and young palms. From looking at the amount of different types of pollen in layers of soil, two of the most common plant species of early Hawai‘i are now nearly extinct because of rodents. With the arrival and subsequent population explosion of Polynesian rats in Hawaiʻi came the corresponding loss of plants and the pollen produced by their flowers. Loulu is a fan palm that formed forests in many lowland areas only exists as individual palms in remote forests, and the only remaining palm forest is on Huelo, a rodent-free islet off Molokaʻi. 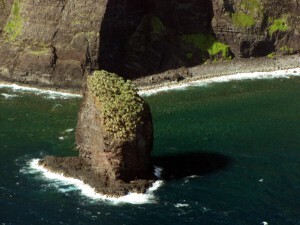 Another formerly common plant, kanaloa, is down to a single, wild individual on a rodent-free sea stack off Kahoʻolawe. Small Indian mongooses were introduced to several sugar growing islands. The introduction of mongooses to Caribbean islands in 1872 resulted in the extinction of half of 39 native skink species, and greatly reduced numbers of the remaining species. Almost immediately after mongooses were introduced to Hawaiʻi, residents saw their impacts on chickens, game birds, and native ground-nesting nene geese. The nene population was estimated at 25,000 at the time of Western contact in 1778, but by the 1950’s ground nesting nene had dwindled to just 30 birds due largely to predation by mongooses and rodents. One study conducted in Hawai`i Volcanoes National Park demonstrated that 77 percent of Hawaiian goose eggs lost between 1978 and 1981 were lost to mongooses. Rodents and mongooses are having the same impacts in forests and conservation areas today, and native plants and animals are still being impacted. Outplanting and restoration of rare native plants and animals requires control of rodents and mongooses. , a balance must be found and struck to ensure the protection of native species in their last remaining habitats (link to Kahuli Aku, a traditional chant about native Hawaiian snails. Listen to the Kahuli Aku and view lyrics.). Through community engagement can lead to culturally and environmentally appropriate conservation and restoration plans. Together, rodents and mongooses are carriers of more than 40 harmful human diseases such as rat lungworm, leptospirosis, murine typhus, rat-bite fever, Weil’s disease, Chaga’s disease, rickettsial pox, tularemia, trichinosis, Lassa fever, leptospirosis, salmonellosis, lymphocytic choriomeningitis, rabies, and bubonic plague (link to history of bubonic plague in Hawaiʻi ). Many of these diseases have an environmental/natural area component, and some that are particularly important to Hawaiʻi are described here. Rat lungworm is a tropical disease caused by a parasitic worm carried by rats (the parasites live in the pulmonary arteries of rats, hence the name “rat lungworm”). The rats excrete the parasite larvae in their feces, which are sometimes eaten by snails and slugs. People can become infected when they eat undercooked or under washed produce with infected snails, slugs, or their mucus. Toxoplasmosis is a parasite that can be transmitted to cats and pigs when they eat infected rodents, birds, or other small animals. People contract toxoplasmosis by accidentally ingesting the microscopic larvae from undercooked pork, or cat or pig feces in soil or water. Infections commonly affect the retina. If the infection settles in the macula, good vision is permanently lost. When contracted by a pregnant woman, it can be very harmful to the unborn baby, and can result in a miscarriage. Trichinosis is a parasitic roundworm carried by pigs and other wild game that have eaten infected rats. It can be transmitted to people when they eat raw or undercooked pork or wild game that contains the parasite. Murine typhus is a bacterial disease that rats, mice, and mongooses can carry. It can be transmitted to people when they are bitten by fleas that have fed on infected rodents or mongooses. In Hawai‘i, 5-6 cases occur each year, although there were 47 cases reported in 2002 and 38 in 2003. Leptospirosis is a bacterial disease that is passed from animals to humans when they come in contact with urine from infected animals such as rodents, mongooses, and pigs. Rats and mice are the most important carriers of this disease in Hawai‘i. People catch Leptospirosis when stream water or mud containing urine from infected animals enters their body through their eyes, nose, mouth or broken skin. From 1907 until 2007 there were thousands of reported cases and at least 32 deaths have occurred due to leptospirosis acquired in Hawaii. In agricultural crops, stores, and food establishments saliva and feces from rodents and mongooses are also a public health concern. In food establishments, they can spread diseases and are an ever-present concern. See video of rats on the loose in downtown Honolulu (link) .More information on the rats and mice as vectors of human diseases can be found on the Hawaiʻi Department of Health’s website, (link http://health.hawaii.gov/san/files/2014/04/rodent-standard-vc-format-with-photo-credits-edit-04012014.pdf). Rats and mice cause direct feeding and chewing damage to agricultural crops in Hawaii such as banana, lychee, macadamia nuts, rambutan, pineapple, coconuts, coffee, sugar, and other fruit and vegetable crops. In Hawai‘i, rats cause an estimated 5-10% damage to the annual macadamia nut crop on the Big Island. Rats like to nest in banana plants and cause damage to the green fruit. They also affect the harvest because of field workers’ reluctance to work rat-infested fields. Rodents also cause damage to seed sources, irrigation tubing, and agricultural storage areas. Mongooses also have a long history of agricultural impacts since their introduction to Hawaii in the 1880s. A 1916 article details the attack of mongooses on farmed eggs, chickens and ducks in Kaimuki. On Maui, damages led to a bounty of 10 cents for every mongoose head turned in (see photo). To understand how mongooses had become such a problem, consider the math. Mongooses can produce an average of 36 young in a lifetime (approximately 4 years). The original introduction to Maui was 72 mongooses in 1883. If just half were female, and half of them survived, this would mean that there were 648 offspring produced in the next 4 years. If half of those were female, and if only half of those females survived to produce offspring, the second generation would result in 5,832 offspring. At this same rate, by 1916 there could have been millions of mongooses on Maui.